After many months of debate amid vocal angry protests in the streets of Tokyo, the Japanese Diet passed through new security bills that would allow Japanese Self Defense Forces the ability to render aid to an Ally such as the United States or participate in military actions in defense of Japanese interests abroad. Many Japanese people estimated around 50% of the population do not support these measures and contend that this will lead to the militarization of Japan and dictatorship. To those pacifists who really believe PM Shinzo Abe is a Dictator we say ばか! This is not 1946! This is 2015 and the PRC and North Korea are taking full advantage of Japan's American imposed Article 9 which restricts Japan's ability to defend itself in international crisis in addition to being restricted from rendering aid to allied nations. This defeatist attitude suggesting that if Abe has his way there will be another war and a certain defeat for Japan is nonsense! Mr. Abe is no Hitler nor is he a dictator otherwise these protesters would have disappeared by now. By supporting such measures, we are not endorsing the extreme right wing Nationalists of Japan but rather endorsing the urging of the United States Government for Japan to take on a greater Security role in the Far East particularly in international waters where Japan's own fishing fleet by which Japan depends on for its very survival is being threatened by the PRC's growing naval presence in the South China Seas and elsewhere that if hostilities were to break out and Japan would have to wait until it was directly attacked would be too late. The entire nation would literally starve into Chinese submission. This we know may sound extreme but that is a realistic scenario the Pacifists are ignoring. Having a deterrent like a stronger SDF will discourage such hostilities which is why the United States has the largest carrier bound fleet in the world. 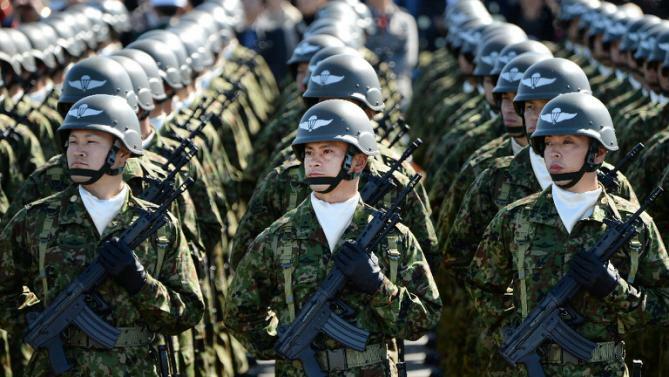 Japan has a small yet capable fleet that is well trained and well equipped. It's SDF and air crews are up to the task but have been restricted for the last 70 years by Article 9. What people fail to realize is that the Japan of the 1930's is not the Japan of today. 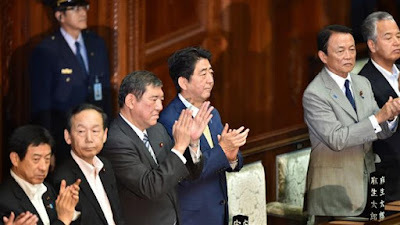 The Pacifists demand that their government not turn its back on 70 years of pacifism yet are okay to turn its back on Japan's long 1000 year history and focus on the dark years of WWII. Japan has learned some painful lessons by waging a war of aggression that will not be repeated. Modern Japan is a mature responsible country that can be trusted in times of crisis and as we write this opinion piece the Chinese Navy is militarizing international waters Japan depends on for commercial traffic and fishing. While many of Japan's neighbors are not ready to or willing to get past the atrocities of Japan during WWII of which Japan's apologies have fallen on deaf ears, we in America can be sure that Japan's quest to expand it's military capabilities can be trusted as a true partner in the Pacific. This is our opinion and not one to glorify war or empower the far right Nationalists nor is it a call for a new militarist Japan of old. This is 2015 and in order to protect Japan's future, we believe that Mr. Abe is doing the right thing.